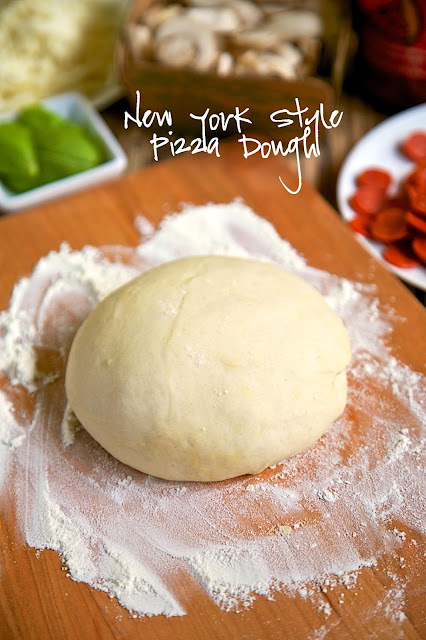 New York Style Pizza Dough Recipe - only 4 ingredients to make the best pizza dough - this dough is so easy to work with! Make the dough and refrigerate until ready to use. Can make up to 3 or 4 days in advance. On our trip to NYC for Memorial Day, we took a Pizza Tour. We went to four different pizza places. One in Little Italy and then got on a school bus to Staten Island for the other three places. You can read all about it here - http://www.plainchicken.com/2015/06/scotts-pizza-tour-new-york-city.html It was SO much fun! We learned so much about pizza. We also got a great recipe for pizza dough. The recipe came from the owner of the pizza tour. He swore by it. I couldn't wait to get home and try it! We have made this recipe every week since we've been home, and it is seriously the best pizza dough recipe. It is super easy to make. It is also so easy to roll out. Some pizza dough is so difficult to roll into a circle. You can stretch it and it pulls back. SO frustrating! I promise you won't have any problems with this dough. I just pressed it out into a circle, no need for a rolling pin. I make the dough several days in advance and let it hang out in the fridge. The dough needs to be refrigerated at least 24 hours before using. It will keep in the fridge 3 or 4 days. The recipe makes three 10-12" pizzas. We bake our pizza on a pizza stone and a pizza steel. Put the stone/pizza steel in the oven and preheat it to 550 degrees. Let the stone/pizza steel sit in the oven for at least 40 minutes before baking the pizza. Roll out the dough on a piece of parchment paper, add toppings and transfer the assembled pizza on the parchment on to the stone (I use a cookie sheet to do this). I baked the pizza for 8-10 minutes (8 on the pizza steel and 10 on the stone). It turns out amazing! Better than any pizza place in town! If you plan on making a lot of pizza at home, I highly suggest buying a pizza steel. The crust gets a really good color on it and tastes amazing. The pizza stone does a good job, but the pizza steel takes it to a whole new level. One note about this recipe. The measurements are in grams. It is always best to bake using grams, so that the measurements are correct. You can get a kitchen scale for under $15 on amazon. We use ours all the time. It is a great investment. In the bowl of a stand mixer, mix ingredient just until blended. Let rest for 20 minutes. Mix on low for 2 or 3 minutes, until the dough is springy and smooth. Divide the dough into three 276g balls. Place each ball in a ziplock bag with a dash of olive oil. Refrigerate dough overnight before using. I'm ordering the Pizza Steel and the scale!! I can't wait to try this. Can you tell us what sauce you used? I believe I read your Pizza Tour blog and thought you said they only use tomato sauce?? No spices? Thanks for all your recipes. I finally got around to making this dough and it was amazing! The dough didn't shrink back after rolling and no rolling pin was required just like you said! It is my new favorite dough recipe. Thanks for sharing! Do you leave the parchment under the pizza to bake it or slide it from the parchment onto the steel? Thanks. I bake the pizza on the parchment paper. Homemade pizza dough is SOOOO much better than the store-bought stuff! And I love how simple and no-fuss this dough is! This looks really good and I am anxious to try it but can you tell me why the recipe is listed in grams instead of cups and ounces? The conversions are not exact and I am worried it isn't going to come out right because I don't have gram measuring tools. Has anyone else made this using Cups and ounces? Baking in grams is much more accurate. This dough is foolproof if you make it using the more accurate measurements in grams. You can get a kitchen scale for under $15. I linked to one on Amazon at the end of the post. I totally agree about having a kitchen scale. Now I want the pizza steel. I will have to try this crust for the family. My 8 yo has been complaining that we haven't made pizza for a while. This pizza steel has me so intrigued! I love me some me some pizza! can you give the standard measurements please? I just looked up the pizza steel and it comes in varying thicknesses. Which do you prefer? Can you freeze the dough to be used later? If you want to freeze it, put it in ziplock bags and then in freezer instead of the fridge. When you are ready to use it, put in the the fridge to thaw and rise. hello :) I do not have a scale, and honestly i don't have enough room in my little kitchen for one (I literally have my kitchenaid mixer in my hallway closet, lol) do/can you convert this into cups/tbsp/tsp? Excited to try this! 2 questions: what type of flour did you use and what temp. of water? Thanks!! I used unbleached all-purpose flour (King Arthur) and regular tap water. It doesn't have to be hot water if you let it proof in the fridge a couple of days. If you want me to make this put it in cups and tablespoons and teaspoons PLEASE! 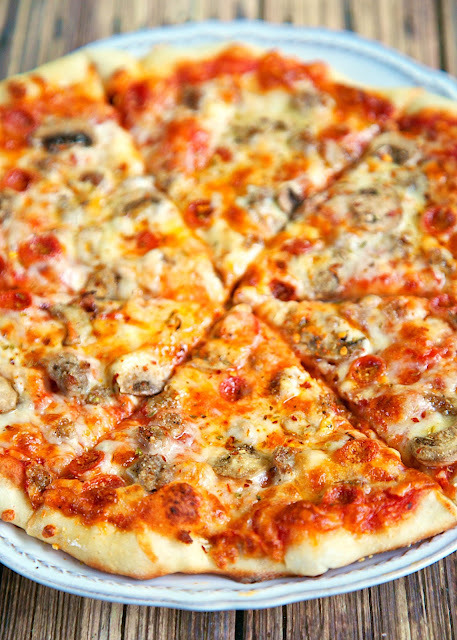 I'd love for you to make the pizza dough, it is the best recipe. However, it works best in the measurements listed above. I won't be converting it. Sorry! I made this dough on Saturday and we had it for dinner on Tuesday and it was amazing! I haven't unpacked my stone yet so I just cooked it at 475 for 12 minutes on a sprayed pizza pan with holes in the bottom. I also just split the dough in 1/2 for two large pizzas. It worked out BEAUTIFULLY! We'd been religiously using the Weeknight pizza dough recipe but THIS is our favorite by FAR now! Thank you! should i use the dough hook or paddle attachment to mix the dough in the stand mixer? Either one. I usually use the dough hook. I will just use my recipe, as this is in grams. You are missing out. This is a no-fail recipe! Very precise since you weigh the ingredients. Very easy, and like the recipe so far. But should the dough change in size while it's in the refrigerator? Mine looks to be the same size as when I put it in yesterday. It does get a little bigger - not double in size. It will be a little bigger and be more airy. If it didn't do this, sounds like it was your yeast. Maybe buy a new jar or packet. Hi! Excited to try this recipe. My family loves pizza! One quick question. Do you allow the dough to rise any after you take it from the fridge, or do you just roll it out cold? Thanks! It rises in the fridge, so just take it out and start rolling. Enjoy! I made this dough and it's been in the fridge. I can't wait to try it. Should I let the dough come to room temperature before using or just use it cold? I know it's probably is silly question, but I wasn't sure. Thanks! I hope to go on a pizza tour one day too now. Your post about made it looked so fun. I use it cold. Enjoy! Sooooo, you were right. This dough is amazing! Not only does it taste amazing, but it is so easy to work with when you pull it out of the refrigerator. It is going to have be my new go to. Thank you so much for sharing the recipe. Do you sprinkle the parchment paper with flour or cornmeal? I use a pizza peel to slide it onto the pizza stone and I use cornmeal. When baking the pizza with the parchment paper, does the crust comes out crispy? I don't put anything on the parchment paper. It comes out crispy when baked on parchment. Enjoy! Since no one else questioned it or commented, it must be right but it surprises me that the amount of salt is more than double the amount of yeast. I love the recipes in grams. I put the mixing bowl and zero it out and start adding the ingredients as listed, zeroing out each time and mix. Great dough recipe, I have made it about 10 times now. Thanks. I don't understand confusion about the grams to cups conversion. There are conversion tables all over the internet. King Arthur Flour has a handy chart on their website. But you may not like the results. For example, from KAF 1 cup AP flour is 120 grams. So, 315g/120g=2.625 cups, which I suppose could be approximated as 2.5 + a pinch. King Arthur also recommends weighing ingredients for best results although they do list ingredients by cups,etc. I know that sometimes there is an exact conversion from metric to standard measurements and sometimes there is no exact equivalent. Buy a scale if you can possibly afford it. I know this is an old post, so I'm not sure if you'll answer! I have been wanting to make this dough since I found you on pinterest. When you freeze the dough, how long before baking should you place it into the fridge to thaw and rise? And also, do you take it out of the fridge for a period of time prior to rolling and placing on the hot stone so it comes to room temperature? Finally, you said you mix it up in your kitchenaid; do you use the dough hook or is the paddle fine to use? I would take it out of the freezer and place in the refrigerator 2 days before I wanted to use it. I just take it out and use the dough immediately. I use the dough hook on my KitchenAid. Enjoy!! Why do you bake on the pizza steel and the pizza stone? Why not cook the whole time on one? You use either the steel or the stone. You don't cook it on both. I have just mixed up my batch of dough for tomorrow night. Eager to try it out and compare it to my usual dough I make.